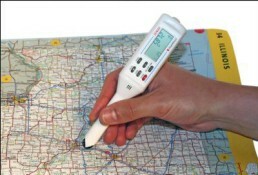 Map Wheel is a simple, fast and accurate way to measure distances on maps, whether in straight lines or along curves. Just set the Map Wheel's scale to match the map, then roll the unit along the route you want to measure. The distance is displayed instantly. Portable, uses two AAA batteries (included). Measures in miles, kilometers, and nautical miles only.